Volkswagen Plans To Sell Majority Of CC's In US, Would Sell Better As Cu. In. The attractive Volkswagen Passat CC, which VW plans to sell as merely the Volkswagen CC despite America's resistance to the metric system, will be going on sale in the US this September and the company apparently has big plans for the "four-door coupe." In a conversation with Automotive News Europe, a VW exec was quoted as saying that the US is expected to make up 60% of the CC's sales. 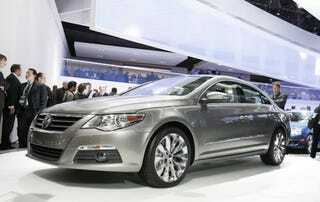 Though we like the look of the new CC in person, that's a pretty steep number for a more-expensive Passat.